After five years of delivering the healing power of music to Los Angeles, Musicians On Call has seen its fair share of moments that are a joy to even witness. 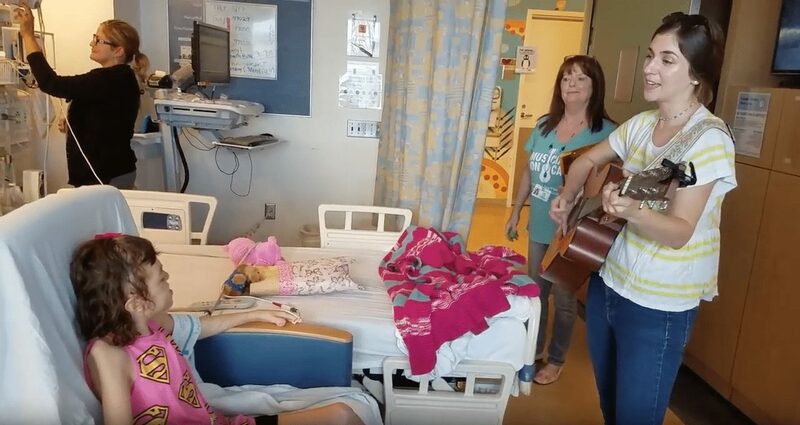 Watching Volunteer Musician Juliet Piper play Frozen classic, “Love Is An Open Door,” for the patient at Mattel Children’s Hospital is a perfect example of those special moments. Special thanks to the patient’s mother, Cheri Niemiec, for sharing this moment with us! Featured in the video is Volunteer Guide Jean Clark, who has volunteered with Musicians On Call since programs began in Los Angeles in 2013. We will be honoring Clark along with Volunteer Musician Beau Wammack at our 5th Anniversary Celebration on February 28th. Do you have a story about the healing power of music? Tell us all about it!